In March 2013 I was appointed to RFA Fort Austin. Within NATO she is classified as an AFSH, that’s to say a combat stores ship with the necessary facilities on board to embark a helicopter. Fort Austin is meant to provide solid stores support to deployed warships. She will carry everything from shells, missiles and torpedoes to packets of crisps and UHT milk, all of which can be transferred to other ships using her heavy jackstays during a Replenishment At Sea (RAS). Fort Austin was the second ship of her class to be built, commissioned in 1979. The lead ship of the class was Fort Grange, commissioned in 1978. In 2000 Fort Grange was renamed Fort Rosalie to avoid confusion with RFA Fort George, commissioned in 1993. Within the RFA, Fort Austin and Fort Rosalie are known as the “old forts”. In the early 90s the RFA introduced Fort Victoria and Fort George; these were on paper at least a much more capable class which combined the roles of an AFSH and an AO (tanker) and are known as AOR. The “new forts” as they are known are meant to be a one stop shop for everything your average warship needs. A floating service station for the Royal Navy. There was a problem though. The new forts aren’t the most reliable ships you could want. In fact in my experience they are horribly over complicated monstrosities which embody some of the worst incompetence and ineffectiveness of British defence procurement. The new forts are deeply unpopular among the RFA engineers, and perhaps more importantly, cost a bloody fortune to operate. In 2008 Fort Austin was put at “extended readiness”, an MOD euphemism for “we can’t afford to operate this ship so we’re going to put a skeleton crew on board and leave it alongside in port indefinitely.” In the 2010 SDSR it was decided to retire Fort George as a cost cutting measure and bring Fort Austin back into service as a cheaper (and probably more effective) alternative. Having been left to rot alongside for over two years Fort Austin would first need a major refit before she could go back into service. In early 2012 she went into Cammel Laird shipyard in Birkenhead for a very big, very expensive and very long refit which was completed in late 2012. After completing sea trials she ended up at the NATO fuel jetty in Loch Striven (yes, we’re back there again). That’s where I joined. It’s quite a long journey from Bromley to Loch Striven, involving four trains, a ferry and a taxi. By this time I was a Second Officer (for you Pusser types an RFA 2/O is the equivalent of an RN Lieutenant). My particular billet on board had me as the senior engineer officer on the 12-4 watch (the old forts have two engineer officers on watch at sea, and unusually for the RFA they’ll also have a single junior engineering officer on watch in port), and I was responsible for the maintenance of the vessel’s four diesel generators. After arriving I also learned that Fort Austin was due to deploy in the summer on Operation Cougar 2013. This was to be the major UK overseas naval deployment of 2013. Upon completion of the Cougar deployment she was to relieve Fort Victoria as the command platform for the joint US/EU/NATO anti-piracy operations off the Horn of Africa (CTF-151). Lots of work was left outstanding from the refit, not least of which was some major seawater system repairs, extensive modifications to the ship’s armament including the relocation of two 20mm cannons and the fitting of two Phalanx CIWS (Close In Weapon System) which were being robbed from the Type 42 destroyer HMS Edinburgh as she retired. Oh, and the installation of a fairly high end communications fit which would allow real time secure audio/video communications with the CTF-151 HQ in Bahrain. It wasn’t long before we made a passage to DM Crombie, which is on the north bank of the Forth a few miles west of Rosyth, where Queen Elizabeth was under construction. In fact once we arrived on the jetty at Crombie you could see QE under construction in the dock at Rosyth. DM Crombie is a rather large munitions depot. We were to remain there for a couple of months whilst the necessary work was carried out on the ship. Once complete we would “bomb up” and go out on sea trials. Once those trials were complete we would come back to Crombie to sort out any snags and then we were due to go through operational sea training (or FOST, for those of you who are familar with these world class purveyors of fun and frivolity). Once FOST was completed we were to join the UK’s Reaction Force Task Group for Op Cougar and deploy first to the Med, then through the canal and into the Indian Ocean for some high profile exercises. The rest of the RFTG would then return to the UK whilst Fort Austin would take over from Fort Victoria as the CTF-151 command platform. Fort Victoria would then return home for a much needed refit as she was utterly shagged. An incredibly busy couple of months ensued with more than enough things to keep the engineering department very busy indeed. Along the way some other engineers paid off and due to the increasingly dire manpower crisis with RFA engineering I found myself becoming the senior engine room watchkeeper on board, and the maintainer of both the main engine and the cargo refrigeration plant in addition to the generators. The RFA had managed to upset its engineers enough that they were leaving the service in droves, and now there simply weren’t enough engineers left with the requisite qualifications and experience to fill the Second Offficer billets. That’s how I became three Second Officers for the price of one! Eventually the work was completed and we went to sea for ten days or so of sea trials. These were mainly taken up with Phalanx trials, culminating in a live fire. Do you know how loud a Phalanx is? Bloody loud when you’re trying to get some kip before going on watch! We also did acoustic ranging, which involved driving the ship over an array of hydrophones in the sea bed off Portland Bill. It has to be done at different speeds and in different machinery configurations. The hydrophones record the noise from the ship and it’s added to a catalogue used by submarines, warships and Maritime Patrol Aircraft (remember when we had those?) so they can identify us from our sound alone. Eventually we got back to Crombie and had to sort out the snags. The snag list was quite long and we only had ten days to sort it all out before the ship was due to deploy on Op Cougar. One of the bigger snags was a problem with the cargo hold bilge system. Fort Austin has five large cargo holds, each one sub-divided into five deck levels. Each cargo hold is served by a large cargo lift. At the bottom of the lift shaft is a bilge well. The bilge well at the bottom of the lift shaft in 3 Hold was filling with diesel. After a bit of head scratching we worked out the pipe which runs from the bilge well back to the pump in the engine room passes through a double bottom bunker tank (a big fuel storage tank in the bottom of the ship). It also passed through an adjacent sea water ballast tank. The pipe must have corroded and fuel was leaking into it and running back to the bilge well. The pipe would need to be removed and a new section fabricated and fitted. The first stage was to pump out both the double bottom bunker tank and the ballast tank so we could access them. This entailed following all the necessary confined space procedures, including gas-freeing the atmospheres inside the tanks. Once the bunker tank was open and safe to enter tank cleaning contractors would move in and thorougly clean the tank inside as hot work would be required to remove the problem pipework. Another local engineering firm which had been doing lots of work on board over the previous months was contracted to remove the old pipework, then fabricate and fit the new replacements. Oh, and 3 Hold was a munitions hold. I suppose we should talk about the munitions holds. Remember I mentioned the RFTG earlier? Fort Austin’s role is to provide the solid stores necessary to keep the RFTG fighting for thirty days. If memory serves me correctly at the time the RFTG consisted of two destroyers or frigates (I forget which), an RFA tanker (again I forget which, I think it was Wave Ruler), and HMS Bulwark and HMS Ocean with quite a significant force of Royal Marines embarked. As such Fort Austin’s holds were crammed with everything your friendly Bootie needs to wage war in far off sandy places. Boxes of 7.62mm and 5.56mm ammunition were stacked deck to deckhead along with Javelin anti-tank missiles, demolition charges, grenades, mortar rounds, plus all the rest of the stuff the warships needed like 4.5 inch shells, Sting Ray torpedoes, Sea Wolf missiles, etc. Normally the ammuntion holds are kept locked and are out of bounds unless you have a reason to be working in one. On the few occasions that I did, I made sure to have a wander around them and it was quite impressive, surreal even. A bit like Costco for stuff that goes boom. Back to 3 Hold. For the duration of the work 3.5 Hold, that’s to say the lowest level where access to the tanks was, had been cleared of ordnance. Both the bunker tank and the ballast tank had been pumped empty and made safe for entry. The tank cleaners were in the progress of cleaning the bunker tank whilst the engineering contractors were ready to start removing the problem pipework. 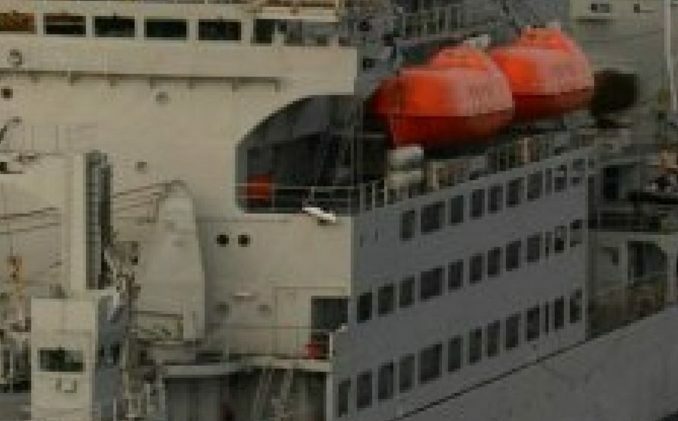 The cargo holds, from the engineering perspective, came under the purview of the engineering department’s First Officer (RFA 1/O is equivalent to an RN Lieutenant Commander). He was the liaison for the contractors working in 3 Hold and was responsible for overseeing their work. It was a fairly standard weekday afternoon. I happened to be the Duty Engineer Officer, responsible for keeping the lights on, the ship afloat and part of the Fort Austin’s Duty Watch, responsible for dealing with any emergencies on board. I was in the Machinery Control Room at the computer and with me in the MCR was the Duty Systems Engineer Officer (i.e. the leccy). I was trying to locate some spare parts for the generators on our bloody useless stores system when the general alarm sounded. After a few seconds the main broadcast announced “FIRE! FIRE! FIRE! FIRE IN 3.5 HOLD. DUTY WATCH TO THE SCENE. HANDS MUSTER AT HARBOUR EMERGENCY STATIONS!” Both the Duty SE and myself looked up at eachother and the same realisation hit us simultaneously. This resulted in a very unpleasant sinking feeling in the pit of my stomach, one I hope I never feel again. As we both pounded up the stairwell to the clearway (the main thoroughfare on the ship where all the cargo holds are accessed from) I quite vividly remember thinking to myself “Well if it does go up I won’t feel a thing, I won’t even realise it’s happened”. I took a little bit of comfort in that. I was sprinting down the clearway towards the access to 3 Hold as the ship’s company were pouring out of every doorway and themselves running to the muster. Down the narrow stairwell all the way down to the bottom of 3 Hold I was gripped by a feeling of trepidation, cursing the fates that this has happened to me. In this situation the Duty Officer is in overall command, but would muster at the gangway with the rest of the ship’s company. As the Duty Engineer Officer my job was to proceed immediately to the scene of the incident and take charge. In 3 Hold I found a scene of what can be best described as grave urgency. To my great fortune that afternoon there was a work party in 3 Hold made up of engine room petty officers and ratings who had been detailed to assist the contractors. The petty officer in charge was a man of immense experience and was also “Q” qualified. In the RFA a “Q” is a petty officer from the engineering department who is the vessel’s firefighting and damage control expert. Although this particular petty officer wasn’t Fort Austin’s Q, he was qualified to be so and regularly sailed as a Q on other ships. This lowest level of 3 Hold was empty, all munitions having been moved to the upper decks in 3 Hold. A couple of kidney hatches were open on the deck and smoke was billowing out of one of them. A motorman was already discharging a foam extinguisher into the bunker tank from the entrance to the hatch. A very rapid confab with the petty officer followed. He told me the tank was empty but what puddles of fuel remained had likely caught fire and there was definitely nobody down there. So the first question is how to fight the fire? We agreed the most effective way would be to get someone down there. However, the kidney hatch was too small to allow a man wearing breathing apparatus to pass through. The petty officer suggested we make use of the ship’s Breathing Apparatus extension masks. These are a mask with an extra long air hose which you can plug into another mask. He suggested we use this extension mask to allow the firefighter to get down into the tank, then we pass the bottle pack down which he can then put on his back before proceeding into the tank. We’d need to send two men down into the tank as they’d be carrying an FB5X (a foam applicator), a drum of foam and a Thermal Imaging Camera (TIC). By this time the rest of the Duty Watch had arrived on the scene and I had quite a few people looking at me waiting to be told what to do. I sent the Duty Systems Engineer Officer to carry out the compartment’s “Kill Card”; a list of isolations to be carried out in the event of a fire. Of particular concern to me was the smoke which I didn’t want spreading through the rest of the hold and to other compartments. Two men were sent to fetch breathing apparatus, plus two extention masks and a TIC, others were sent to fetch an Fb5X and yet more were detailed to start rigging fire hoses at the entrance to the bunker tank, I wanted one hose with an FB5X and another hose with a water wall nozzle ready to go. At the entrance to the hold was a ship’s internal telephone. I called the quatermaster’s station next to the gangway and briefed the Duty Officer on the incident, the action being taken and that I had established an FCP (Forward Control Point) for the incident inside the entrance to 3.5 Hold. I requested more foam drums be brought down to 3.5 Hold, plus ram fans for smoke clearance and a back up field telephone be rigged between 3.5 Hold and the gangway. The last thing I requested was a five man firefighting team be made ready and sent down to the FCP. I also mentioned it would be prudent to begin rigging for boundary cooling in adjacent compartments, i.e. the hold spaces which did have munitions stored in them. Thinking ahead, a five man firefighting team on air would be able to function in a smoke filled 3.5 Hold and could flood the tank with foam from the entrance hatch should our efforts to extinguish the fire from within the tank fail. Potentially we could have just put the lids back on the tank and try to starve the fire of oxygen, but the problem there was I didn’t know how hot it would get first and how that might effect the munitions. To be honest I didn’t want to find out. Besides which the FOST creed is the good old “continuous, aggressive attack” on any fire. My next call was to the MCR where I confirmed with the Engineer Officer of the Watch that the fire main had been pressurised and was ready for use. And breathe! Now I had a few seconds to think. What have I missed? What have I forgotten? What more can I do? Am I sure there’s nobody dying in that tank? Satisfied that there was nothing more I could do in that moment I started to help with the rigging of fire hoses. Time, as they say, goes fast when you’re having fun (or the ship is on fire). The breathing apparatus and extension masks appeared very quickly. From the Duty Watch I selected the Leading Hand (Deck) and Leading Hand (Engineer) to be the men to go down into the tank. I reasoned they were both experienced, knew what they were doing, and more importantly could fit down the hole. I briefed them to conduct a thorough sweep of the bunker tank using the TIC, and to put plenty of AFFF foam on any hotspots they found… don’t spare it. With the extension masks on they went down one by one, the air bottle being passed down to them once they were through the hatch and in the tank. Next the TIC and the FB5X branch and drum of foam were passed down. “And behind there?” he gestured to the forward bulkhead. “And there?” he gestured to the after bulkhead. “What’s the blast radius?” he asked. “Seven miles” the MEO replied, in the totally deadpan way he would normally deliver the punchline to his naff jokes. Now I have no idea where he got that figure of seven miles from, nor if it’s true, but that moment struck me as totally surreal. What the effing hell am I doing stood on a ship loaded with hundreds of tons of bombs and missiles that’s on fire? One suddenly contemplates one’s career decisions. Apparently satisfied that we were doing everything we could and there was nothing more he could do, the local fire brigade commander disappeared back out of 3.5 Hold and by boss came and had a quick confab with me. He was happy with the action we had taken and agreed with my plan of withdrawing to the clearway and having a five man firefighting team flood the tank with foam if we were unable to put the fire out. Fortunately it never came to that. The two LH I sent down into the bunker tank exinguished the fire. I had them stay in the tank for another twenty minutes or so in case it reignited. Satisifed there were no more hot spots in the tank I got them out and started overseeing the rigging of ram fans for smoke clearance. Everyone who was in 3.5 Hold that afternoon ended up in the ship’s hospital for the once over. Three were taken to the local hospital and were treated for smoke inhalation and made a full recovery very quickly. So what happened? What caused the fire? Remember the engineering contractors who were supposed to remove the corroded pipework? They started cutting the old pipework out of the adjacent ballast tank without a hotwork permit. As they cut the pipe away from the penetration between the ballast tank and bunker tank the hot sparks fell into the bunker tank and ignited the puddles of diesel and diesel soaked rags used by the tank cleaners. Speaking of whom, they had decided to go and have a cup of tea in their van on the jetty not long before the fire started. The first sign of the fire was when the work party in 3.5 Hold spotted the smoke coming out of the tank hatch. This was a very serious matter. A contractor starting hotwork without a permit? They said the First Officer had given them the go ahead to start hotwork. He denied it. Much finger pointing ensued. I later learned that the fire had resulted in the Forth River being closed between the road and rail bridges in the east and Grangemouth in the west. The Marine Accident Investigation Branch became involved too. The next morning an officer from RFA HQ arrived to conduct an investigation. All key personnel involved were to be interviewed as part of the RFA’s internal investigation. As the Duty Engineer Officer I was among the first to be interviewed. I was asked to provide my account of what happened, where I was when the alarm first sounded, what my initial actions were. Then I was asked if I had briefed the Duty Watch muster that morning that hot work was taking place in 3.5 Hold. I told him I had not briefed the Duty Watch about any hotwork because I had not been made aware at any point that hotwork was planned. I was also asked how closely I was monitoring contractors on board. I told the investigating officer to look at the previous day’s Daily Orders. There were no less than TEN different groups of contractors and visitors on board that day, and how was I or the Duty Officer expected to closely monitor them and also carry out our other duties and responsiblities? I stated quite emphatically that we were trying to squeeze too much work into these ten days alongside before the deployment and this fire was the inevitable result of that. After my interview I spoke to the Duty Officer and learned she had told the investigating officer much the same thing. When the report was published both myself and my shipmates were exonerated of any blame. The report identified several factors which resulted in a contractor undertaking hotwork without the necessary permit and safety meaures in place, including unrealistic timelines putting ship’s staff under undue pressure to complete the defect work list. No further action was taken against anyone involved, at least that I’m aware of. I especially remember that night in the bar someone put Billy Joel’s “We Didn’t Start The Fire” on the sound system. That got a few laughs. So what did I take away from this? After the dust had settled and I’d had time to contemplate it, I remembered pounding down those steps to a fire in a munitions hold not knowing at all what I was going to find when I got down there. In those moments I fervently wished to be anywhere else but on that ship. However, at the same time I was more afraid of failing in my duty and responsibilities. It was my job, it was what I was supposed to do and what was expected of me. What else was I going to do? One thing the RFA gave me was a very strong sense of belonging to something bigger and more worthwhile. The thought of letting my shipmates down, and indeed the marine engineer cadre was unthinkable. I hope this means I’m not a coward. Next I thought a lot about all those faces looking at me “what do we do now?” I remember when I was a cadet I had been told not to become too friendly or familiar with the ratings and petty officers, because when the faecal matter hits the fan they are going to look to you for direction and leadership and that line of authority has to be crystal clear and unambiguous. You can’t be their friend and their officer. I now realise the veracity of that advice. The pressure one is under in such a situation is immense. Something very bad and very serious is happening and you are the one on the spot. You are in charge. Everyone is looking to you for leadership. You have the responsiblity. Nobody else is coming to save your sorry arse. The next realisation was all the training, the countless drills and exercises which always seemed like such an embuggerance had in fact prepared me as well as anyone could reasonably be to take charge. For as long as I live I swear I will never moan and chunter about exercises and drills again. That one event was perhaps the biggest test of my abilities I faced in my time at sea. I passed it, but what a humbling experience it is when you see all those faces looking at you for direction and leadership. I grew up a hell of a lot that day, as an engineer, an officer and a person. I was very fortunate that day and I remain hugely impressed and proud of the competence and professionalism of my shipmates. I’m also grateful that there was nobody trapped in the tank when the fire started, that we didn’t have anyone incapacitated in the tank, that we extinguished the fire quickly and that the two blokes I had to order into the tank to put the fire out both came out unscathed. One last thing, the photo of Fort Austin above was taken a day or two after I paid off in August 2013 as the ship made her way south to the Mediterranean. The especially eagle eyed puffin may just make out an inflatable killer whale lashed to the hand railings underneath the port bridge wing. There’s a bit of a story to that. Suffice to say quite how it ended up in official MOD publicity photographs was a matter of some consternation for the CO and XO. Those suspected of involvement were interrogated. Harshly. My lips remain sealed. They’ll never make me talk. To my shipmates I remain loyal until the bitter end. War, Hnnghh! What is it good for?